The kids love cars. They’ve got a whole plastic carton devoted to various Matchbox, Hot Wheels and other assorted cars. Up until now, though, their RC experience has been a bit limited. We’ve had a few RC-type toys meant for kids (a Lightning McQueen car and a Buzz Lightyear spaceship), but they were bulky and never quite worked right. These toys were soon pushed aside in favor of others. 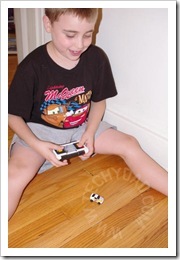 When the Hot Wheels Nitro Speeders box arrived, I was excited to (re)introduce them to the world of RC cars. The kids, however, were even more excited than I was. They barely tolerated me taking photos of the box and cars before I put batteries in the controller/case. I was stuck by how small these cars were. You can see, in the comparison photo above, that they are just bigger than a quarter. 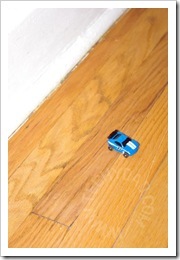 I’d worry about the cars getting lost, but, luckily, Hot Wheels has addressed this. The controller doubles as a case. Even better, the case triples as a charger. The car itself contains a non-replaceable Lithium-Ion battery, but the case runs off of 4 AA batteries. 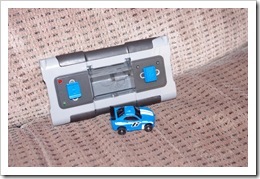 Connect the car to the case via a cable (inside the case) and the car can quickly be charged. I didn’t time the charging, but it was definitely ready in under an hour. All of this wouldn’t matter, though, if the cars weren’t fun. Luckily, they are plenty of fun. Again, my kids put up with me clearing the hallway of any obstacles (and closing doors so the cars wouldn’t scoot under beds). Then, they not-so-patiently put up with me videoing myself playing with the car. Once this short video was done, I let them have at them. Notice the two cars. B got selected for this review as well. 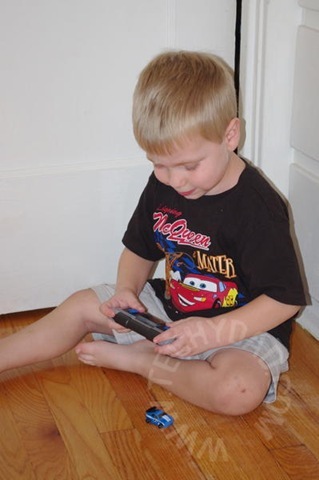 It wound up being a good thing because otherwise the boys would have fought over the controller. Of course, still photos of smiling faces and racing cars is one thing. It’s quite another to hear their reactions and laughter. 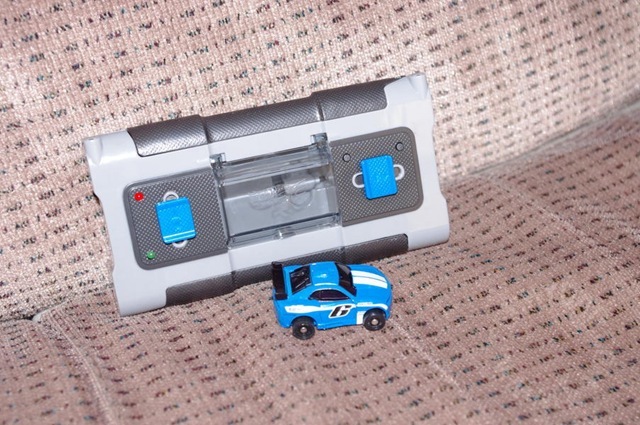 The box says that it is for ages 8 and up, but JSL (age 4) had no problem operating the car. 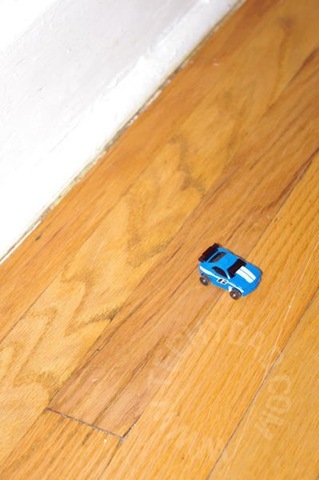 I’ll admit that I couldn’t quite get the car to go where I wanted it to go, but that could be the fault of my inexperience with RC cars more than the fault of the controller. Even without pinpoint accuracy, I had fun making the car race, turn, and spin out. This is definitely a toy that I’d recommend for kids or even grown-ups. 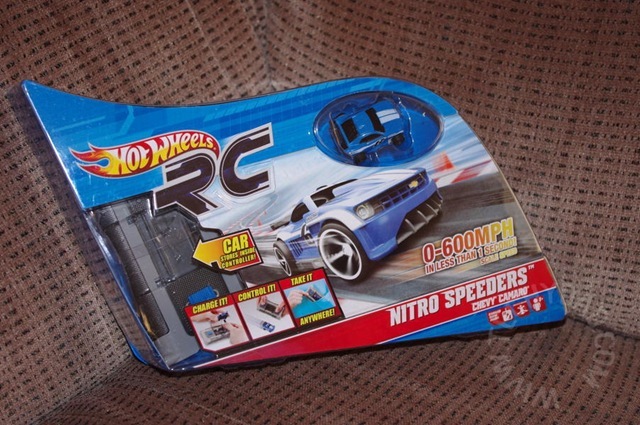 You can win a Hot Wheels Nitro Speeders RC car. To enter, simply leave a comment below answering this question: What kind of cars do your kids like playing with? To enter, please follow the rules above within the comment section. Contest starts today, August 25th and ends at Noon EST on September 12th, 2011. You do not have to be a blogger to enter, but must leave a valid e-mail address for me to contact you for mailing address once the giveaway is over. I will select the winner using random.org and contact you via e-mail. You will have 48 hours to claim the prize. If there is no response, another winner will be selected. Open to U.S. residents only. Disclaimer: I wrote this review while participating in a campaign by MomSelect. 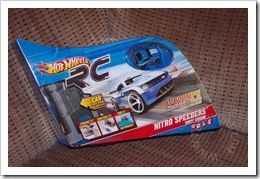 I received a Hot Wheels Nitro Speeder to review. All opinions above are my own. My son likes any type of monster truck. My son is a big Hot Wheels fan. 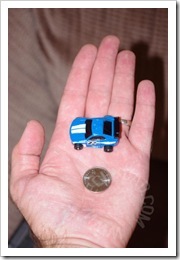 I entered B’s Hot Wheels giveaway. Not entering the giveaway – but just wanted to say I liked the review, especially the videos! The boys look and sound like they are having SO much fun! My son would have LOVED these when he was younger! 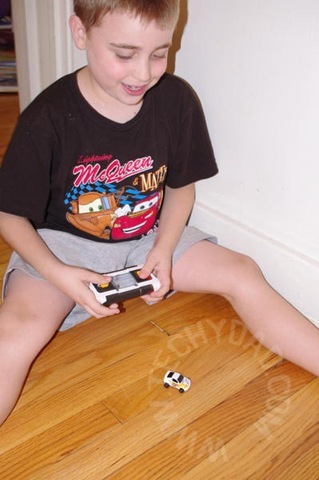 My son loves RC cars of all sizes. 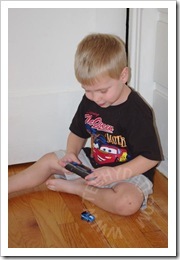 My kids love all kinds of cars-especially hot wheels! My sons play with any kind of cars..
Also, I totally follow you on Twitter. My kids love playing with all types of cars. Anything from hot wheels, remote control or even wooden cars. 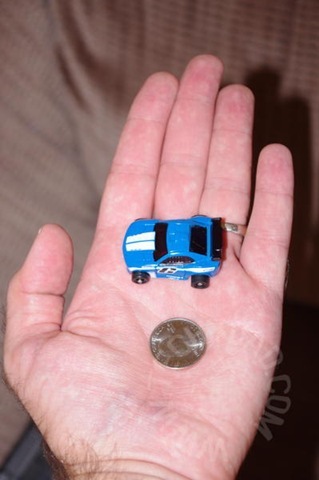 Following hot wheels on twitter. Commented on Dinner at CiCi Part 1. Sara Phillips recently posted..Chobani Winner! Sara Phillips recently posted..I am so PROUD!